I could pay my bills for a couple 3 months with the money in that setup, damn that sucker is nice! 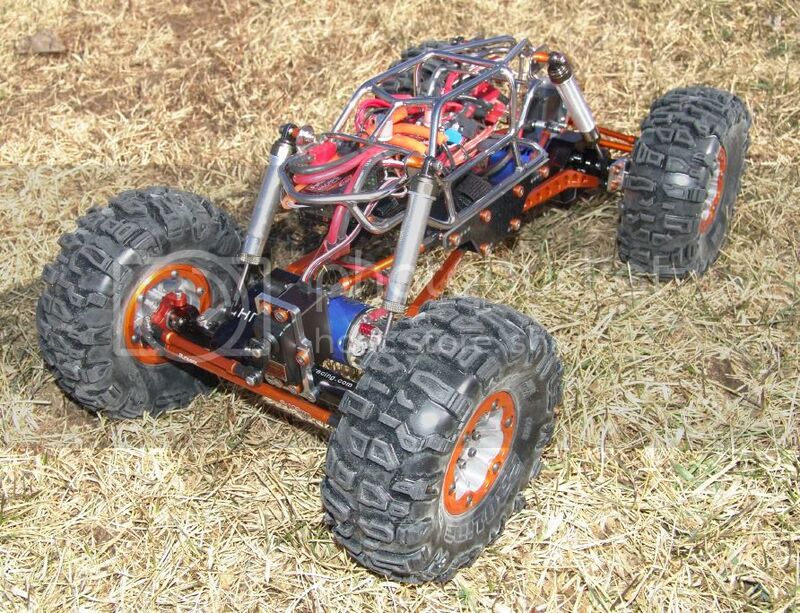 We got a guy in our club who just build a HR axled truck with dual ESCs. He was not even dialed in and it was a beast. Once he gets some wheeltime, and learns that setup, he will be tough to beat. Thanks guys. I'm not sure you'd get three months worth of bills paid with this set-up, at least not yet. Maybe when it's done you could get a couple months worth, but that would include everything, right down the Deans plugs and battery packs. I've ordered up the last of my parts, but yet again, things are still on back order. 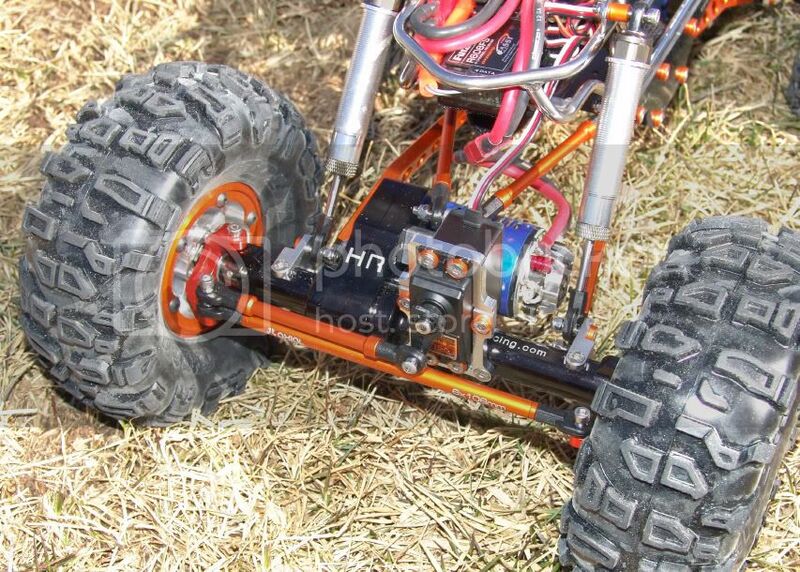 Power will be coming from a couple of Tekin FXR speed controllers and two 35 turn Tekin hand wound motors. The Novak 55 turn motors will be replaced. My good friend just bought a Tekin FXR / 45T motor combo, and on 8 cells, it's wheel speed is perfect. I plan to run 6 cells only, so I went with the 35 turn motors. I can always gear it down, if I want. I went back and forth on battery packs for a while, unsure if I was going to run 2/3A cells (eight) or sub-C cells (as many as I could cram in the chassis). I opted for sub-C cells. Some 4600 mili-amp hour cells. I'm shooting for hour plus run times. 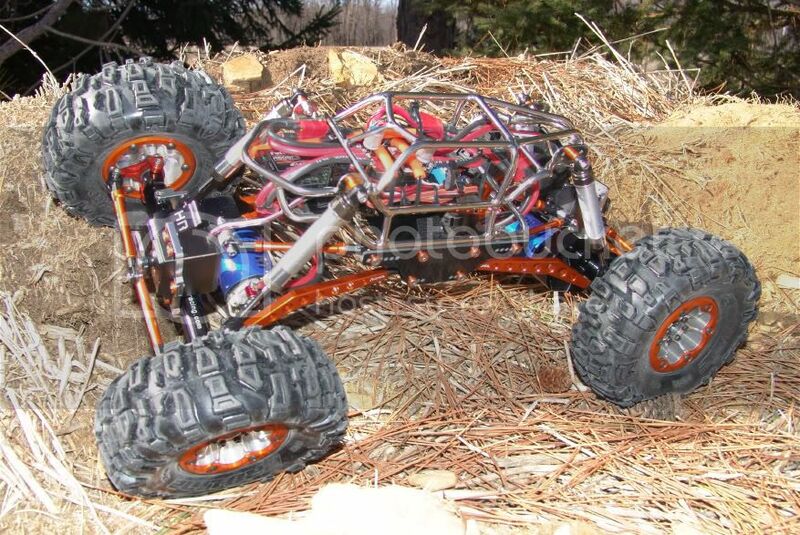 I also saw the new Pro-Line Chisel 2.2 tires, so I ordered a set. They should be killer. 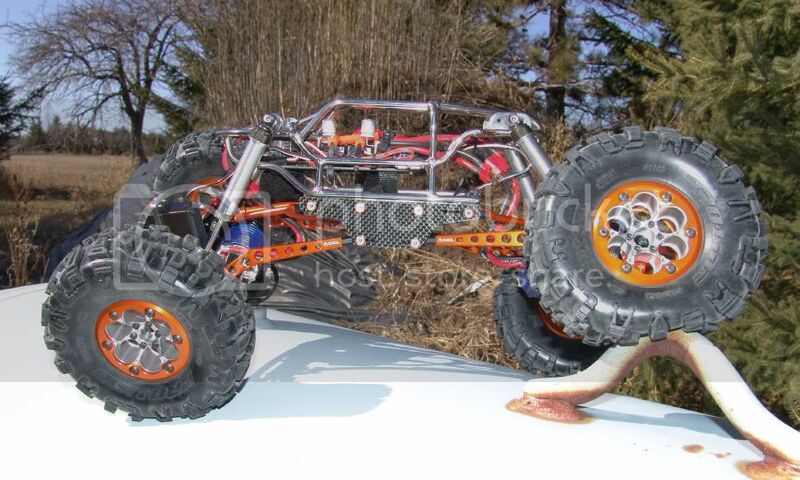 They are some of the tallest 2.2 tires available. I still have the back order blues. Chisels, Tekin FXR/motor combos, and shocks are going to hold me up. Looks like I can expect them Feb. or so. 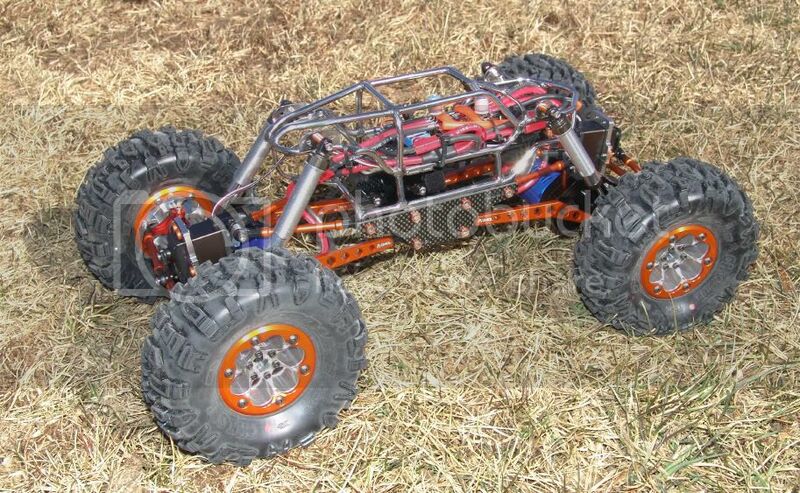 After helping my friend get his new AX-10 going, and running it a little, I am really excited to see my Warthog run. 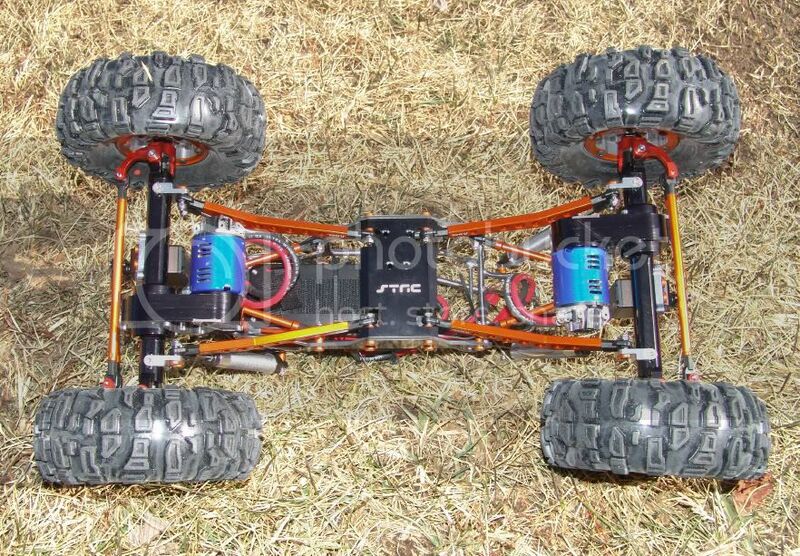 I'll be throttling the dual ESC, individually for greater control as well. Oh well, stay tuned. Ideas without actions never become bigger than the brain cells they occupy. 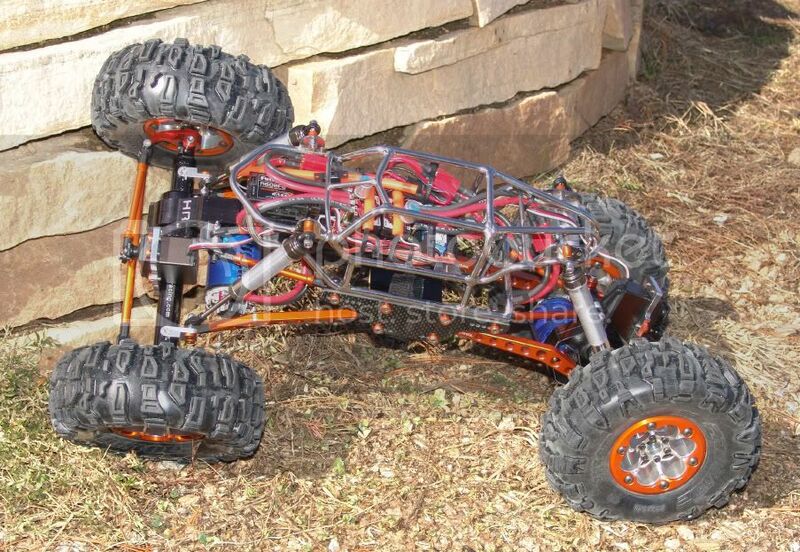 That crawler looks like something out of TRON. love it! makes me want to scratch it all up. Guys, thanks for all the nice comments. I applogize for the lack of updates, but today is your lucky day because I finally have something new to share! It's been waaaay over due, but when you're waiting for parts, what can you do? I was waiting forever to get my speed controllers, motors, and shocks. Those bits and pieces had been on back order since Jan, but the last of them showed up this week, so I dedicated a bunch of time to the Warthog this weekend! 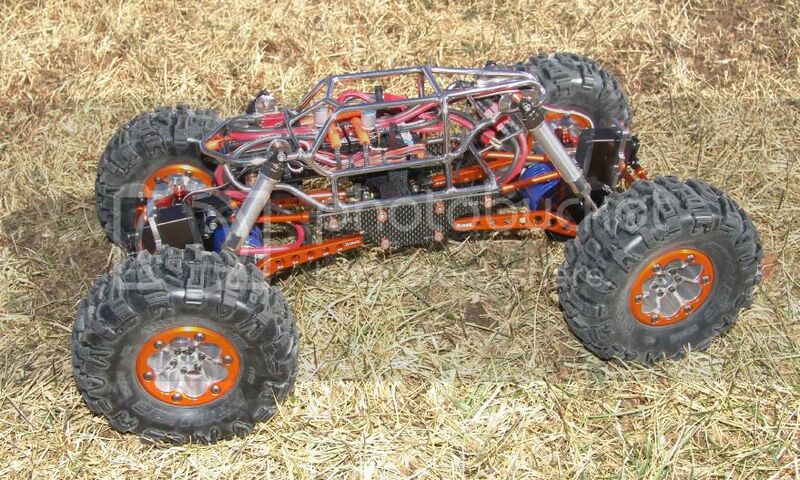 The good news is the Warthog is now a running crawler. It took forever, but the first drive was totally worth it. Power management is handled by two Tekin FRX speed controllers, each with it's own Tekin 35T Pro motor. It's an excellent combination and I couldn't be happier with their performance. After seeing my buddy's AX-10 with the Tekin FRX/45T combo, I knew I had found the best brushed system out there. I didn't plan to run more then 6 cells, so I went with the 35T motors instead to keep some of the wheel speed. And boy oh boy, does thing have wheel speed! I've currently got 14 tooth pinions on the motors and it really gets up and goes. I may be looking to get it down to some 12 tooth pinions, but even so, the low end torque is excellent. Originally I didn't plan to run an external BEC, but in the end I decided why not. So I picked up a Castle Creations 10 amp BEC to handle the current draw of the servos. So far it's been working great for me. 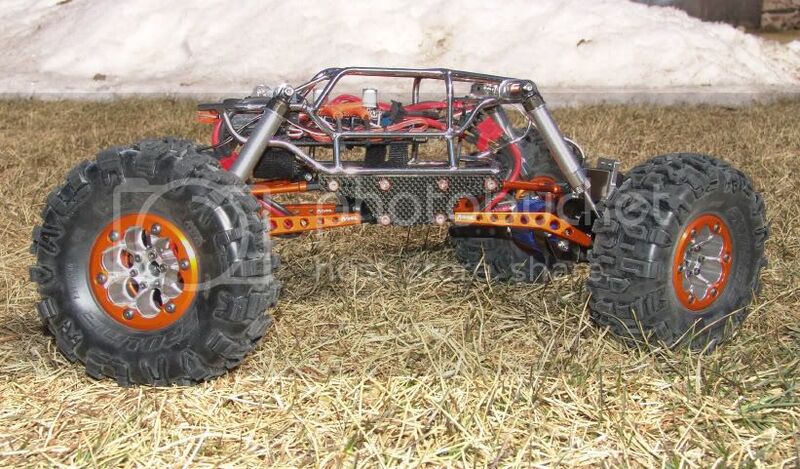 Space is extremely tight inside the Warthog chassis. It proved to be a wiring nightmare, at least at first. I wanted independant throttle control of the Tekin FRXs, independant steering, front and rear, and adding the external BEC just made it all the bit tighter! Course it doesn't help that the receiver is a larger 9 channel unit either. Needless to say, my upper electronics plate is packed! Times like these make me really appreciate the small size of the Tekins, and because they have such a small foot print, the velcro I used didn't have much surface area to grip. The battery and motor wires proved to be able to peal the ESCs up, so I additionally strapped the FXRs down with a zip-tie, and to prevent any maring of their displays, I slipped the zip-ties through a piece of fuel tube (orange of course), before sinching them down. I also ran my receiver's dual antenna wires through another hunk of fuel tube to keep them isolated from any noise, since they are laying right on top the servo, BEC, and power wires. 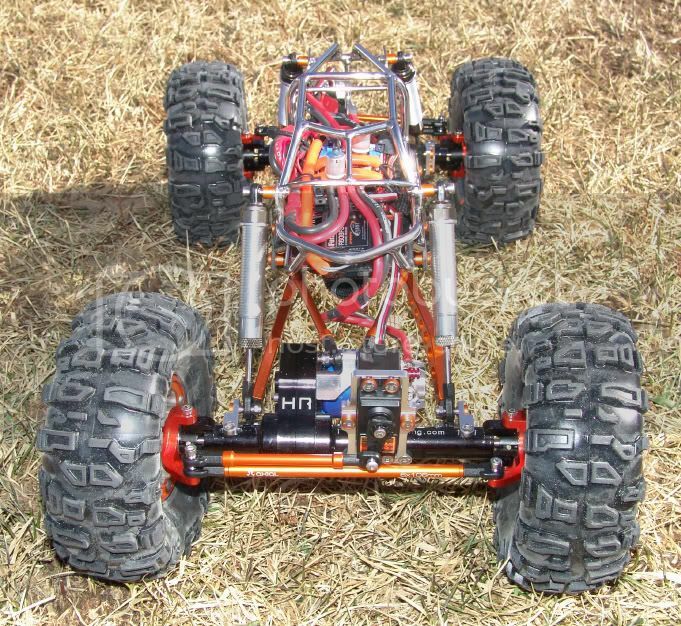 A couple other additions and changes I made include 4 link mounts for the Hot Racing axles - purchased from CKRC - and an upgrade from Pro-Line Hammers to Chisels! 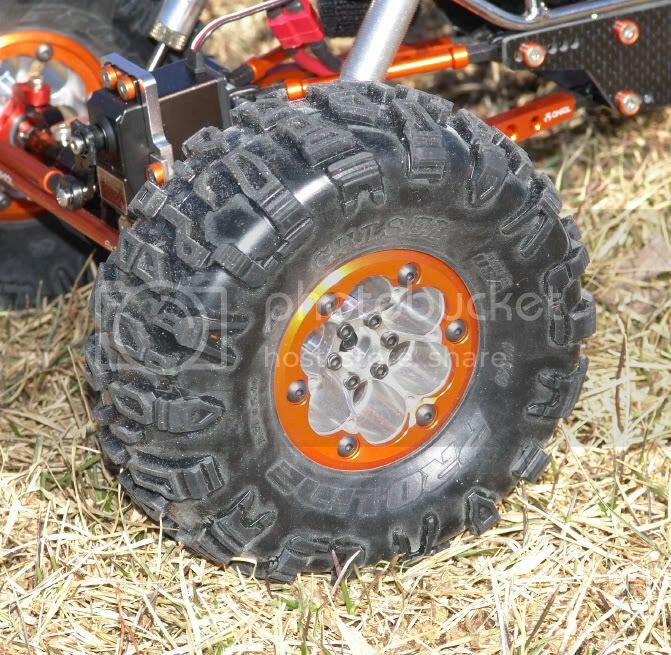 These are really nice tires! Also, I should note my suspension is kind of unique. It's what I call a 75/25 droop set up. There are two internal springs. A longer, softer spring inside the shock body on the shaft end, and one stiffer and shorter spring on the piston side. It's been working really nice, so far. I am not running any shock oil at all. The pressure of the two springs combined seems to provide a nice amount of dampening, but I have not run the truck on the rocks yet. If it's not enough, then I'll be looking to add some light shock oil. 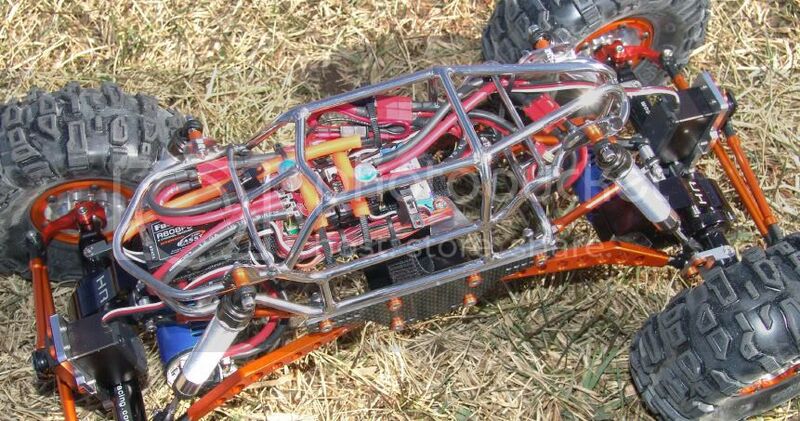 Articulation is really good, but perhaps to much, so if needed, I'll be limiting that with some fuel tube inside the shock. 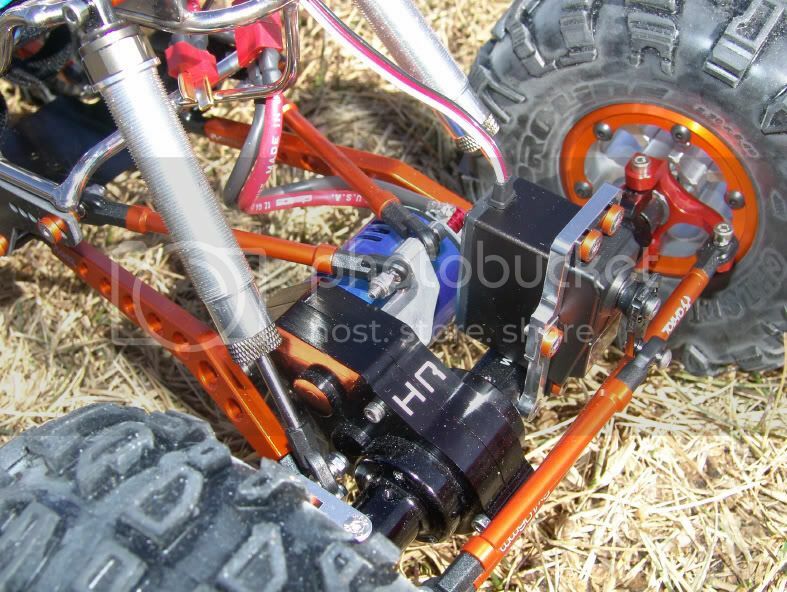 The shocks mostly travel down, droop style, when articulating, but if the chassis is really pushed, the heavier springs, top side of the pistons, will compress and give just a little extra twist. It's practically a dual rate shock. I still need to get the body pannels figured out. Paint....or maybe another idea I have. 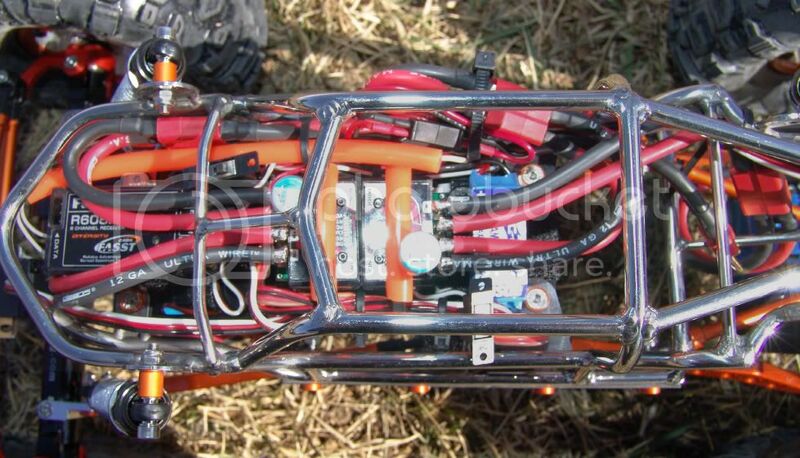 I also want to build a battery pack or two. Custom sub-C 6 cells packs, as I want the best runtime possible! I've seen 2/3A powered rigs run long times, so sub-C cells should push my crawler into the 1 hour plus range? 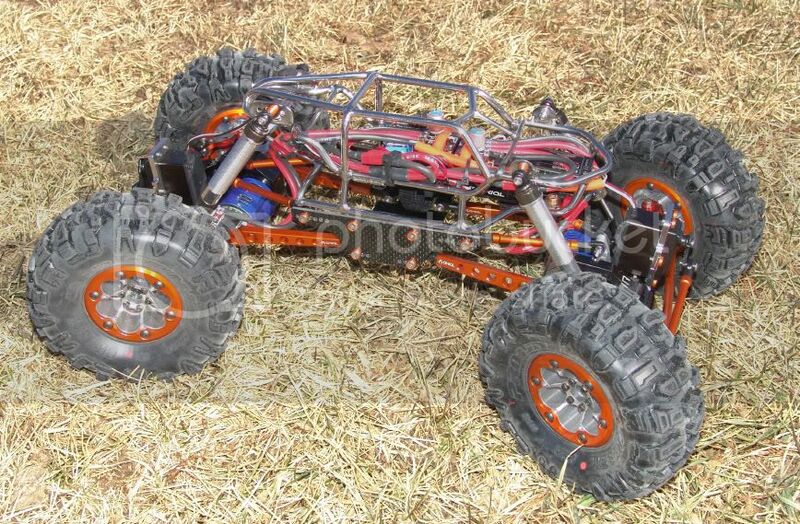 It's so nice to be able to drive this crawler, after what feels like forever. It's only been about 4 months, but worth it. My radio is programmed just like my super class Hustler Clod. Normally I drive with the right stick, but the left stick lets me bias the power and speed front to rear, do dig turns, or complete 360s, and with a flip of the toggle I can mix steering, or have total independant control. I need more practice driving with this configuration, but this 2.2 is A LOT of fun to run, so I am sure it'll get lots of use and I'll get better the more I drive. Rig looks good, Love those rims. Are you going to put some weight's in them? What do you plane on doing with the rg? Comp's or just GTG's. Find all posts by Creepy Inc. Thanks. These rims are designed to take weights, but so far I haven't really had a chance to acess wether or not they are needed. 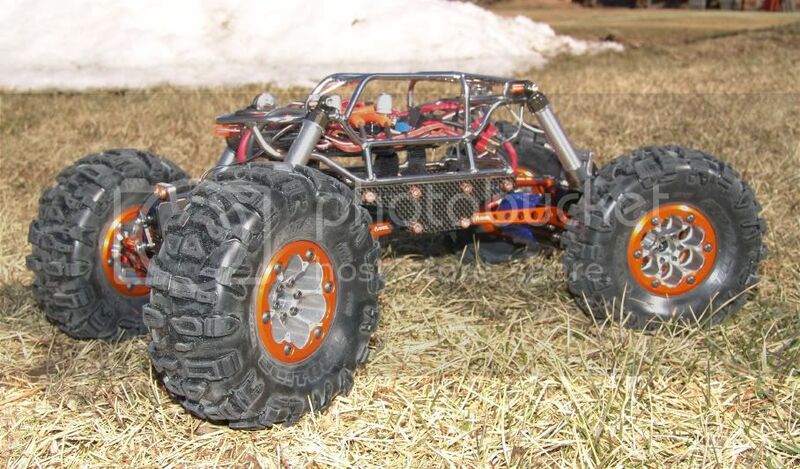 The Warthog weighs about 7 pounds right now, and that's with a sub-c six cell pack. I know lots of guys put weights in the front tires, but I don't know if it's needed yet. I've seen some benefits to a nicer 50/50 weight, but once I drive it a little more, I may try both ways. The weights are easily added or removed without removing the entire rim from the axle. 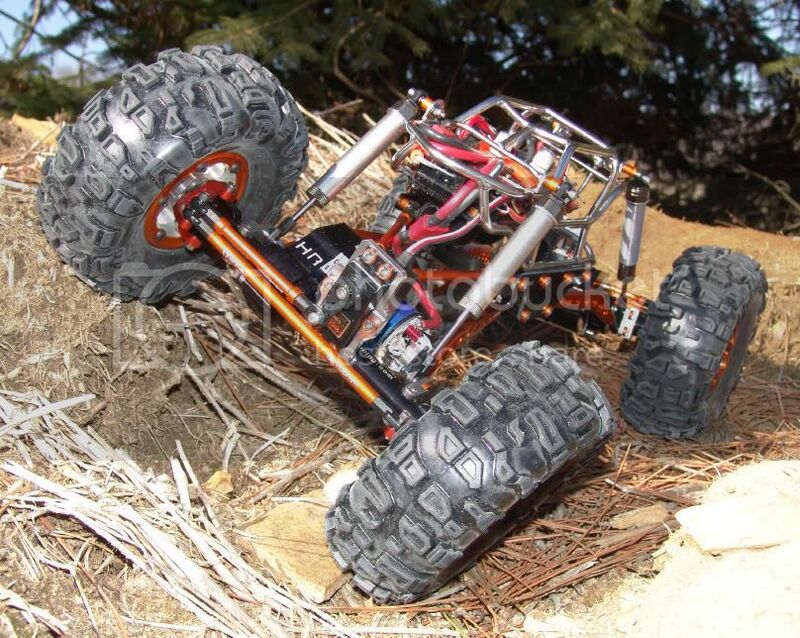 As for comps or GTGs, crawling isn't really big in my state yet. I built this thing mostly for my own enjoyment, but I wouldn't mind trying a comp someday. So far I know just a couple guys in Wisconsin who crawl. Only one really close by. A good friend of mine. He and I will do some crawling for fun. That's probably the extent of it, at least for now. Sounds good. I have found that once you start to make rig more comp ready it takes away from the visual appeal. 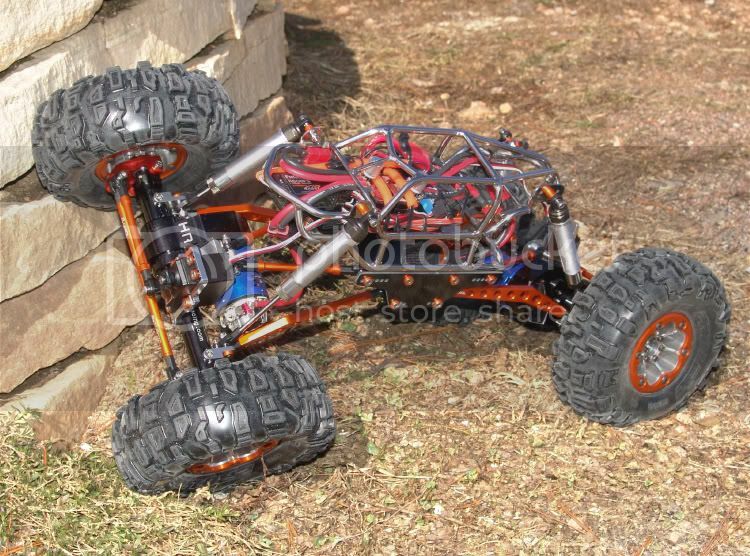 I have built my crawler to be comp-able so I've started on a scaler for GTG's.